After years of playing gigs everywhere from suburban backyards to dive bars, Van Halen — led by frontman extraordinaire David Lee Roth and guitar virtuoso Edward Van Halen — had the songs, the swagger, and the talent to turn the rock world on its ear. The quartet’s classic 1978 debut, Van Halen, sold more than a million copies within months of release and rocketed the band to the stratosphere of rock success. On tour, Van Halen’s high-energy show wowed audiences and prompted headlining acts like Black Sabbath to concede that they’d been blown off the stage. By the year’s end, Van Halen had established themselves as superstars and reinvigorated heavy metal in the process. 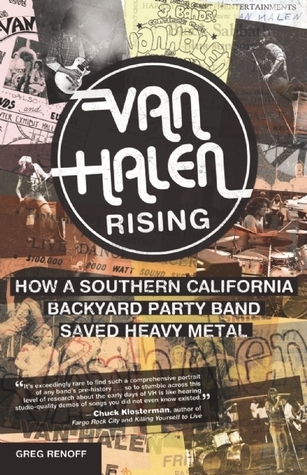 Based on more than 230 original interviews — including with former Van Halen bassist Michael Anthony and power players like Pete Angelus, Marshall Berle, Donn Landee, Ted Templeman, and Neil Zlozower — Van Halen Rising reveals the untold story of how these rock legends made the unlikely journey from Pasadena, California, to the worldwide stage.